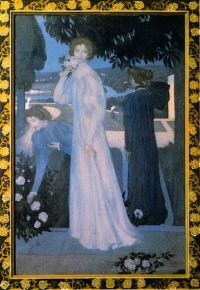 16/6/10 – Acquisition – Paris, Musée d’Orsay – The masterpiece by Maurice Denis (ill.) which just joined the Musée d’Orsay is an important acquisition for French heritage. In 1982, the planners of the future museum had tried to purchase it from the Parisian gallery who owned it at the time but to no avail, given the lack of funds. The painting then left the country after being sold to the British Rail Pension Fund which placed it on deposit at the Tate Gallery before ceding it in 1984 to a private collection, well known notably for its Symbolists and post-Impressionists. It had remained in London since then. The Musée d’Orsay turned directly to this private collector to acquire the triple portrait of Yvonne Lerolle, the daughter of the painter Henri Lerolle, who later married Eugène Rouart, the brother of Ernest Rouart, in turn the husband of Julie Manet. Maurice Denis was close to the Lerolle family who were part of the artistic circle composed of painters, writers and musicians (one of Yvonne’s aunts, on her mother’s side, was married to Ernest Chausson). This work, which the artist presented as a gift to Yvonne, is particularly interesting since the same person is portrayed three times. Several preparatory sketches held at the Musée Maurice Denis in Saint-Germain-en-Laye reveal how he developed the composition, first painting the model by herself then progressively adding other female figures which are then transformed into Yvonne Lerolle. _ Painting the same person several times in a work is nothing new in art history. The Italian Primitives already availed themselves of this process to represent several episodes of a story in the same panel and this procedure continued to be used until Mannerism. In the 17th century, there are examples of painted portraits enabling sculptors to execute their work, such as the Triple Portrait of Richelieu by Philippe de Champaigne at the National Gallery in London. There is no doubt that the painting now joining the collections at the Musée d’Orsay is a key work of the Symbolist school. The beauty of this canvas is further enhanced by its painted frame , produced by Marthe Denis, the artist’s wife. In closing, we would like to mention that Yvonne appears in an Edgar Degas photograph acquired by Orsay in 2004 representing Henri Lerolle and his two daughters (see news item, in French, of 9/7/04). For this reason, we are publishing the picture with its frame, contrary to custom.